Established in 2012, Agroceutical Products is owned by former sheep farmer Kevin Stephens. 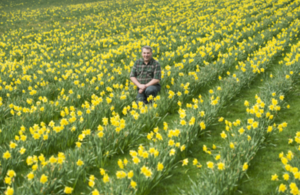 The company grows its daffodils 1,000 feet above sea level in the Black Mountains in Powys, which means they produce more galantamine than daffodils grown anywhere else due to the altitude. I’m delighted to see that the team at Agroceutical Products are bringing the medical benefits of Welsh daffodils to Alzheimer’s patients worldwide. Home to over 5,500 life sciences companies, the UK is a global leader in scientific innovation. The Department for International Trade stands ready to help businesses expand their reach internationally. I would encourage all businesses to make the most of the offer set out in our Export Strategy, and to get in touch with our teams across the UK. It’s amazing to think that the Welsh national emblem, the humble daffodil, has the potential to improve the lives of Alzheimer’s patients across the world, while providing an economic future for hill farmers and their families across Wales. There has been greater interest in plant-based pharmaceuticals in recent years and there are many untapped plant compounds that could become very important drugs in years to come. We’re extremely grateful for the support we’ve received to navigate a difficult development pathway. The assistance from the UK Government, Welsh Government, multiple universities and many enthusiastic individuals has helped us develop a methodology that is sustainable, scalable and cost-effective.